A birthday they won't soon forget full of exciting, interactive activities. The Chandlery Building is home to the Long Island Explorium. The building was built in the 1890’s and served as the chandlery, a store that sold nautical gear, candles, rope, sail repair kits and all of the other equipment a ship would need for a long voyage. A modern chandlery sells goods typical for fuel-powered commercial ships, such as oil tankers, container ships and bulk carriers. Supplies for the 21st century incorporate nanotechnology to provide more efficient and effective assistance to a ship’s crew such as Nano sunscreen, nanomagnets, and barnacle busting paint made with carbon nanotubes to make an extra hard finish that reduces drag. At this exhibit, we offer visitors a beach in a boat. 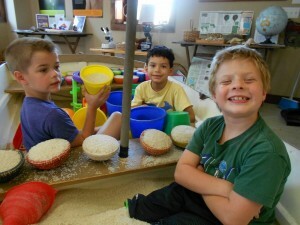 Using grains of rice, young visitors compare volumes and solve rate problems; fundamental mathematical skills that apply to many maritime and marine challenges. text message with your cell phone or use our electronic device to send a message to a friend and receive one in return! At this exhibit, visitors explore concepts of mechanical advantage – the idea that certain tools allow us to do jobs that we couldn’t easily do without them. The Ship’s Hull houses multiple types of materials with which visitors investigate structures and forces. 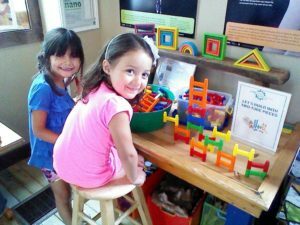 This exhibit zone also features a new science focus each week. This is were we make ice cream, build boats, try to predict volume, build a compass and much more! Each week brings something new and challenging! Here, visitors can chart a course and pilot a virtual ship around Port Jeff Harbor through fair and foul weather. Be careful to avoid the shallows and other traffic! Along the way enjoy the sights and sounds along the shore and learn about the history of Port Jefferson harbor.